Winter is not willing to let go of it’s grasp on the foothills and the rest of Alberta just yet. This last week has seen up to another foot of snow accumulate on the ground. Hillsides closer to the mountains that had been exposed by Chinook winds have been layered with snow again. 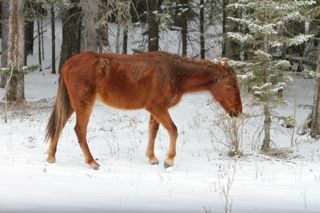 In many locations we are not finding horses, even though they have wintered in these areas for many years. 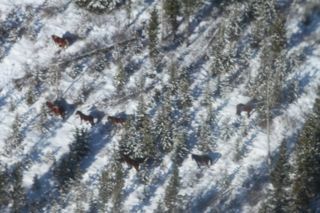 Also we are finding many horses by themselves or herds where 2-3 members are gone. This yearling filly we found wandering alone with a good gash on her front right shoulder. 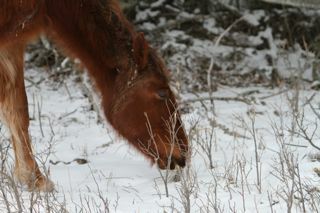 She was nibbling on low brush and what ever grass she could paw from the snow. 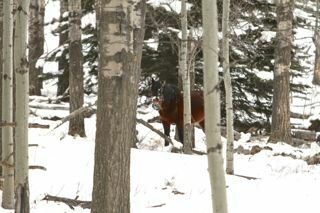 We have been keeping an eye on her and slowly moving her toward another small group of horses a mile or so away. We are hopeful that with a little help she will be able to join up with this other band of a stud, mare and foal. Nibbling on soft brush shoots. 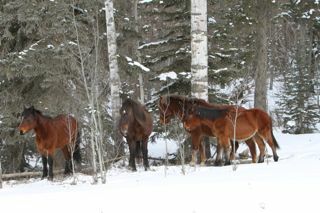 Winter indeed has taken a toll on your wild horse numbers and I am sure we will loose a few more before the real warmth of spring starts to melt the snow to expose more forage for them. A couple of the ESRD’s aerial census counts have been done, but a few have had to be put off for a day when the weather will allow the helicopter to fly. The one that we are aware of is the Sundre equine zone where last year 541 head were counted. 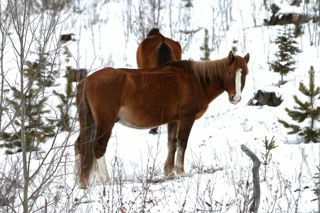 This year with a member of WHOAS aboard a the count only revealed, 346-354 wild horses. From my own experience and that of other WHOAS observers, the previous counts have been very thorough and I am sure that the ESRD staff would be trying to be even more so this year. Maybe a few may have been missed but you can not fly over that country with good snow cover, looking straight down through the trees and miss a 173 head of horse. Some individuals, especially those opposed to the presence of your wild horses, state that the biggest reason for the number discrepancy is because they say the horses were in the trees. In my experiences and those of others that during the daylight hours the horses are more likely to be along the fringes of the forest if the snow is deep. But no matter what there will always be tracks which indicate horses nearby. In the times I’ve been up upon seeing these tracks we would circle many times and even if the horses were in the thick of the timber you would be able to spot them. Therefore we are confident that the ESRD staff and their independent spotters do a thorough count. 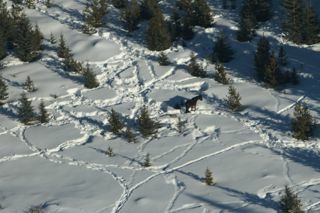 Even by road or on snowshoes we are finding horses are missing from a large part of these ranges. We make sure to go out after fresh snowfalls to find the signs of horses we are looking for hoping we will find some where they have been missing. No luck many times. 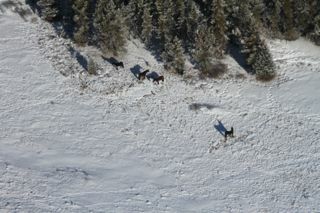 One of the reasons when there is deep snow that you will find the wild horses along the edge of the tree line, is this will be one of the first places that any sunshine at all, will expose forage. Another point is that the wild horses will hang out in the aspen thickets where even last year’s leaves will give them some nourishment. Even from the air or from the road you will be able to easily see the horses here. WHOAS had been adamant that no capture season was necessary due to the high foal mortality rate in 2012/2013 and the toll that this winter was going to take on wild horse numbers. It is nice to hear through another site that new life has begun in your wild horse herds with the first foal of 2014 being spotted in White Spirit’s herd. Let’s hope that this little one is joined as the season progresses by many more new ones throughout the wild horse herds. WHOAS continues to move ahead for alternate and humane solutions to proper wild horse herd management. This includes the contraceptive program and an educational and handling facility. This facility would allow for schools, 4H groups and the general public to visit and find out more about our the wild horses and the history they played in our province. We love your idea of a education and handling facility. If you need any hands on help let us know, willing to help wherever we can. The President of the AEF came to speak to our horse club this week. He sided totally with the government on the wild horse issue speakng about the damage to grassland caused by horses. He didn’t know what happened to the captured horses and said the count was suspect since horses could hide in the forest. He also mentioned the distrust some people have of the government. Whoas will have to promote the facts openly and agressively. Also, the Natives must have stories of the wild horses through the centuries. The elders may have some interesting and educational stories.